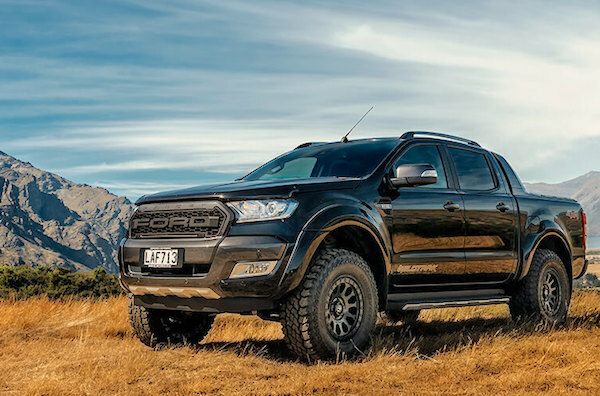 The Ford Ranger holds over 7% of the New Zealand market in April. New car sales in New Zealand lodge their second year-on-year decline in the past three months at -2% in April to 10.423 units, yet the year-to-date volume remains in positive territory, up 1.4% to hit an all-time record at 50.744 registrations after four months. Toyota freefalls 26% year-on-year due to a new fixed-price sales model but remains in the brand lead at 12.6% share vs. 17.7% YTD. Ford (-12%) is also hit hard but manages to stay in 2nd place at 10.7%, distancing Mazda (+7%), Holden (-2%) and Mitsubishi (+2%). Suzuki (+6%) and Kia (+3%) shine in the remainder of the Top 10 whereas Hyundai (-32%), Nissan (-17%) and Volkswagen (-8%) struggle. Further down, notice Tesla (+500%), Jaguar (+200%), Renault (+157%), Peugeot (+153%), Honda (+114%), Subaru (+97%), LDV (+69%), Lexus (+61%) all Mercedes (+26%) posting spectacular gains while newcomer Haval breaks into the Top 30 brands in NZ for the first time at #28. Note Mazda (+7%) is the best-selling brand in the passenger car segment, overtaking Toyota (-26%) to hit 11.1% share vs. 10.4%. Toyota’s weakness this month enables the Ford Ranger (+7%) to comfortably reclaim the #1 models spot it holds year-to-date with 7.1% share vs. 6.1% so far in 2018. The Toyota Hilux drops 20% to #2 ahead of the Mazda CX-5 up 20% to #3, the Holden Colorado (-2%), Nissan Navara (+2%) and Mitsubishi Triton (-13%), making it five pickup trucks in the Top 6 while the Isuzu D-Max post its first Top 10 finish since last June at #9. The Suzuki Swift soars 81% to #7, the Holden Captiva is up 45% to #11, the Nissan Qashqai up 32% to #11 and both the Mitsubishi Eclipse Cross (#16) and Hyundai Kona (#19) end the month inside the Top 20. Other great performers include the Honda Jazz (#13), Subaru Outback (#15) and Subaru XV (#17). Full April 2018 Top 70 All-brands and Top 30 models below.